Arlene Horal is a Senior Litigation Paralegal with more than two decades of experience. She focuses her paralegal practice in trial preparation and insurance law. She also has experience in business litigation, including that involving securities and investments, contracts, real property, bankruptcy, personal injury, medical malpractice, and probate. Ms. Horal assists attorneys with all phases of the litigation process, including state and federal civil procedure; subpoenas; background investigation regarding witnesses, judges, attorneys and expert witnesses; witness coordination and interviews; and document marshalling, management and review. Additionally, she drafts letters, memoranda, document summaries, chronologies, timelines, pleadings, discovery, disclosures, witness and evidence grids, and all pretrial documents. Ms. Horal also has substantial experience with internet and software investigation and legal research tools, including Accurint, LexisNexis and Westlaw. 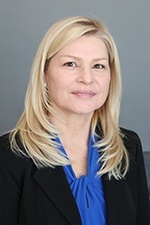 Ms. Horal joined Hinshaw & Culbertson LLP as a paralegal in October 2014 as part of the merger of Hinshaw and the Los Angeles-based firm of Barger & Wolen LLP, where she had been a senior ligation paralegal since 2005. She has worked as a paralegal in both law firms and insurance companies. Ms. Horal's law school accomplishments included having been a member of the Dean's List and receiving an AmJur Award in Insurance Law.